I agree that it doesn't need to be remade, though in some ways it's a reflection of the era in which it was filmed. The late 1960's were the flowering of visual and aural psychedelia and the movie was a stoner's dream-come-true. The aforementioned "10 minute wormhole sequence" was an obvious high point in that respect, but what I remember being the standout sequence was the slow docking of the spacecraft with the space station to the tune of The Blue Danube. That experience, under the influence of the "pernicious" chemical of the day and in a Cinerama theater (It was filmed in enhanced Panavision but initially shown on Cinerama screens.) is something I remember vividly fifty years later. The "Thus Spake Zarathustra" planet alignment sequence is another mind-blower, as the kids used to say. The image of the rotating "star baby" at the end too, showing that even out of the sterility man had created for himself could come renewal. Even the first image, the MGM lion rendered graphically in the style of the Zig Zag rolling papers guy, created a buzz around the film that made it a counterculture must-see as well as a more mainstream hit. No amount of dialogue or linear storytelling could convey what Kubrick did visually in the opening sequence, in which the ape toying with a bone discovers he can make it an instrument and immediately slaughters one of the placid creatures which had been up until then peacefully grazing alongside the ape. It escalates to combat with other apes, the ape throws the bone into the air in triumph and the spinning bone becomes the spaceship, thereby tying the future man who has mastered space to the ape who has learned to kill. How could that ever be expressed in dialogue? It's funny the meaning of that sequence is perfectly clear to us, and 99% of people who say they "just didn't get" 2001 say, "I understood the HAL part of the story, but when the monkey (sic) throws the bone in the air and it becomes a spaceship....whaaa?" "I didn't understand what the people in the black monolith were saying to the monkeys." 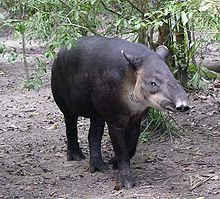 And those primitive piglike animals at the beginning are Tapirs, lovely little creatures. Their noses move like mini elephant trunks. Interesting choice of animal for the movie. This was just shown again last night on TCM's essentials. I rewatched it for the first time in a few years. This is one film that can truly be called "unique". This a great one for the music, sets, direction and FX, it is a movie to be "experienced" more than simply watched. I don't understand every single part of it and I don't care, I am just knocked out by the visual splendor, the dialogue (which is minimal for most of film) takes a back seat to it. You should read Arthur C. Clarke's novel. It explains everything very clearly, and the next time you watch the movie there won't be any confusion. In fact, you'll realize that all of the info was there in the movie but expressed visually instead of verbally. I had seen the movie several times before finally reading the book, and I was fairly certain what was going on, but the book puts it into sharp detail. And the novel was written concurrently with the script (both were an elaboration on an earlier Clarke short story).